For someone who is originally from Canada, Robbie Robertson has a real pulse and understanding of American roots music and history. After all, they are the ingredients to the music he wrote and crafted for the Band, making him one of the greatest songwriters in rock. 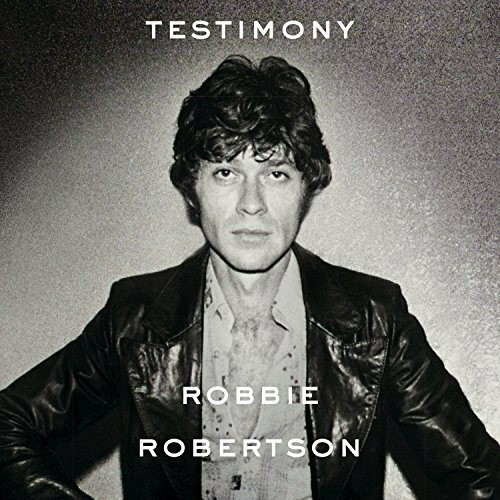 A companion to his recently-published memoir of the same name, Testimony is an 18-track career overview spanning Robertson’s work with Ronnie Hawkins and the Hawks, Levon and the Hawks, Bob Dylan, and the Band–as well as a solo artist. There are definitely some of the famous songs he made with the Band but featured as archival live performances rather than the studio recordings (“The Night They Drove Dixie Down,” “The Weight,” “The Shape I’m In”); it also contains the Band’s collaborations with Dylan on “Obviously 5 Believers” and a live rendition of “Rainy Day Women #12 and #35” from Before the Flood. And then there are Robertson’s solo works beginning with 1987’s Robbie Robertson (“Somewhere Down the Crazy River”), through Storyville, and Contact from the World of Redboy (“Unbound”), the latter drawing inspiration from his Native American roots. The ‘new’ track on this set is a 2016 remix of the title song from the solo debut, a grinding and groove-oriented soul-rock number that’s inspiring especially in this current political and social climate. Certainly there’s less of a focus on the obvious ‘hits’ (tracks from the debut record such as “Broken Arrow” and “Showdown at Big Sky” are omitted) and to showcase more of his range through his inclusion of perhaps lesser-known songs like the Band’s “Twilight” or his own “When the Night Was Young. And that’s what makes Testimony so interesting and satisfying—it’s a document of Robertson’s songwriting genius in capturing the human condition with integrity.